Anthony Russo teaches Music to Grades Pre-K- 6 as well as 7th/8th Grade Douglaston Drum Ensemble, Grades 4-8 Bayside Glee Club, and Grades 6-8 Douglaston Jazz Band. He also runs the annual Christmas Shows. 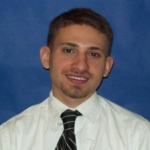 Mr. Russo graduated from Five Towns College with a Bachelors and Masters degree in Music Education. He has studied privately with many notable instructors and plays Percussion and Piano. Mr. Russo aims to teach students, through both encouragement and example, to strive toward a greater goal of excellence in music. Using principles and mechanics he wishes to make each lesson meaningful, fun, and relevant for each student. He very much looks forward to fostering the musical abilities within all students at Divine Wisdom Catholic Academy.